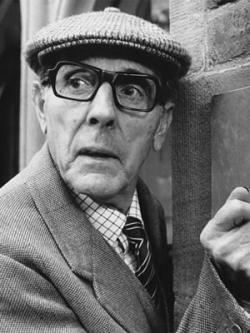 Is it irreverent to wonder if Eric Sykes, or at least his spirit, will still be working somewhere even after his death? Throughout an extraordinarily long career as a performer and a writer he appeared with and penned scripts for a huge range of comic and dramatic stars, including the likes of Frankie Howerd, Tony Hancock, Jimmy Edwards, Harry Secombe and Spike Milligan in his earlier years. For some of us he is most closely associated with Hattie Jacques, who for several series played his (unlikely given their builds) twin sister. Even for today’s teens his voice will be familiar from their childhood, thanks to his appearances in both Teletubbies and Harry Potter and the Goblet of Fire. But it was not longevity but quality that set him apart: he was a comic writer of genius – his script for The Plank just one proof – and an ever reliable provider of cameos and comedic turns – his role in Monte Carlo or Bust a great example. It seems almost irrelevant to mention he was completely deaf for much of his working life, something overcome with, and from which he derived, humour. A funny hero.